Moving day jitters stood no chance of getting in Steve Fallon’s head, let alone taking up residence. 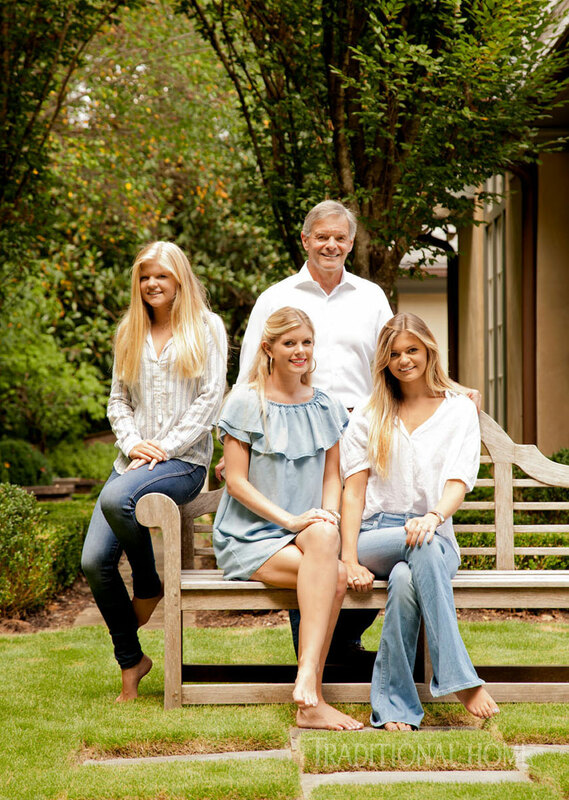 Yes, the Atlanta entrepreneur had just bought a 12-year-old Buckhead house that was a bit dated, a bit dark—not quite the place that teen and twentysomething daughters Darby, Ellie, and Grayson might consider prime real estate. But Steve wasn’t worried. He had a couple of trusted friends—designer Suzanne Kasler and architect Rick Spitzmiller—along for the journey. 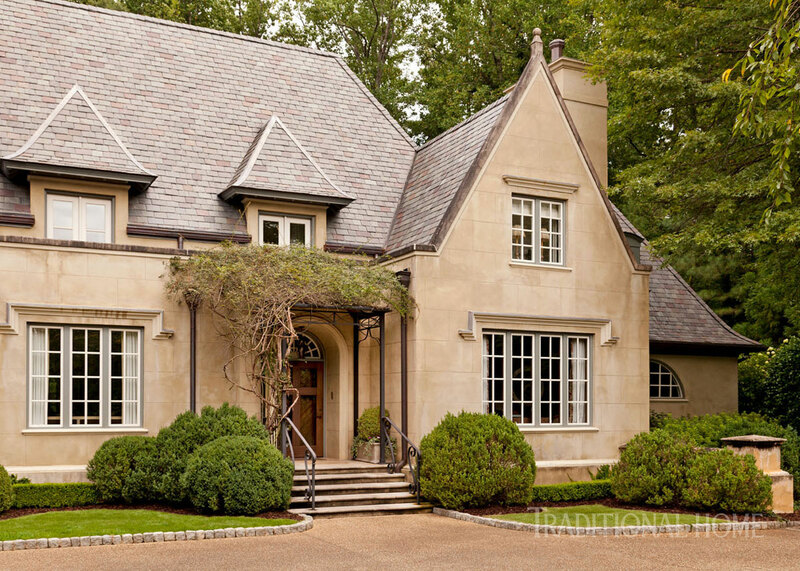 Gracious new dormers and a slate roof imbue the house with the Country French style that Steve loves. Architect: Spitzmiller & Norris, 349 Peachtree Hills Ave. N.E., Suite C-5, Atlanta, GA 30305; 404/812-0224, spitzmillerandnorris.com. Interior designer: Suzanne Kasler, 425 Peachtree Hills Ave., Suite 21B, Atlanta, GA 30305; 404/355-1035, suzannekasler.com. “The house had great bones, but it needed to be rethought for the Fallons’ tastes and the way they live,” Spitzmiller says. 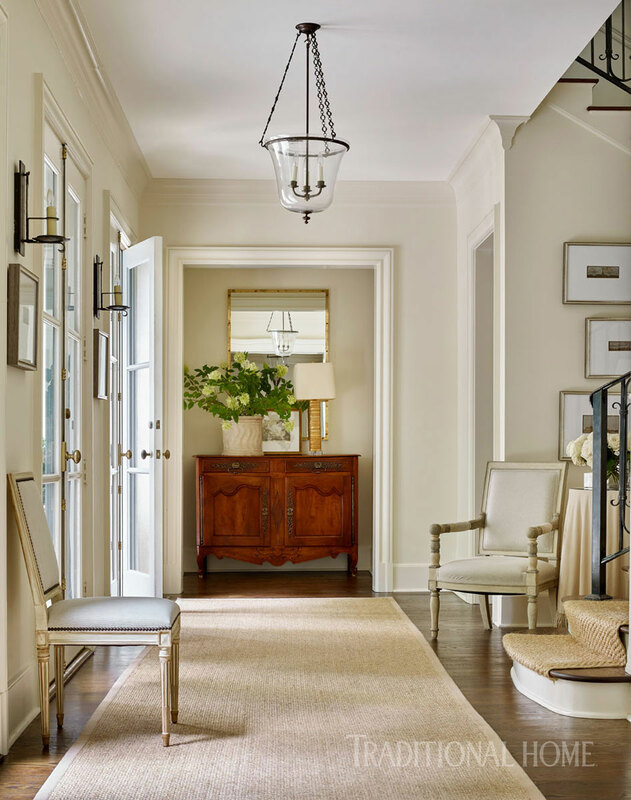 That meant a more open, sociable floor plan, along with architectural upgrades such as coffered and beamed ceilings, paneled walls, and character-rich moldings. Wall, ceiling, and trim paint (“Linen White” #OC-146): Benjamin Moore, benjaminmoore.com. Chandelier (“Courcelles”/Giltwood #CL0052.GI): Vaughan, vaughandesigns.com. Leather chair: Jerry Pair, jerrypair.com. Console table (“Dalmore Console” #142, by Macrae Designs): Lee Jofa, leejofa.com. Art (Halien landscapes in handpainted frames): Fred Reed Picture Framing, fredreedframes.com. “In doing a renovation, we look for the weak points,” Spitzmiller says. 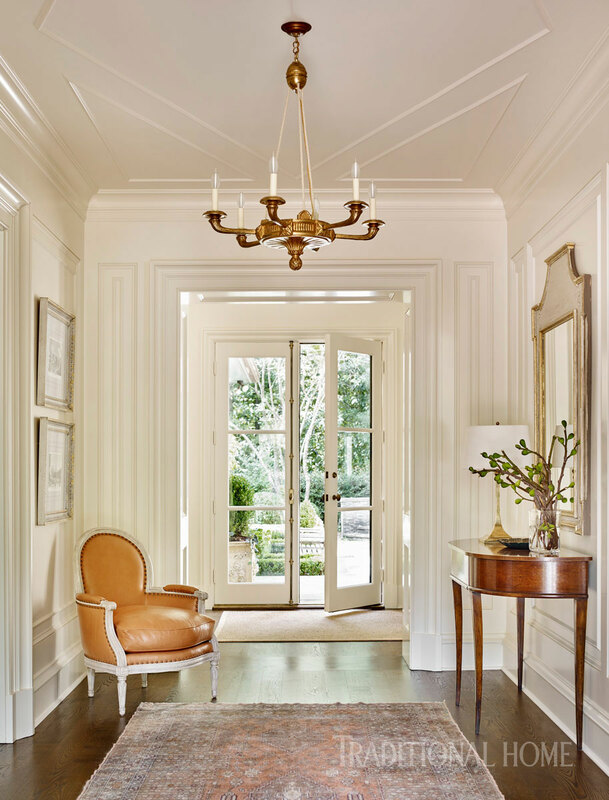 “The entry, for instance, didn’t have visual cues to give it architectural scale or make it welcoming.” New moldings now match the sophistication of a grand curved staircase and set the stage for Kasler, famed for her elegant interiors, to ply her considerable talents. Wall, trim, and ceiling paint (“Linen White” #OC-146): Benjamin Moore, benjaminmoore.com. Sisal area rug (“Pecola”/Seagrass): Stark, starkcarpet.com. Hanging light (“Glass Bell Jar Lantern” #F-LN16): Formations, formationsusa.com. Armchair (“Campagne Armchair” #DL-CH41): Dennis & Leen, dennisandleen.com. Wall sconces by door (“Cardiff Sconce”/small #8037): Gregorius/Pineo, gregoriuspineo.com. Lamp on credenza (“Feather Lamp,” discontinued): Baker, bakerfurniture.com. Planter on credenza (“Roman Planter” #F-PL06): Formations, formationsusa.com. Mirror behind credenza (“Brass Mirror with Rivets”): Antonio Crespo, Loft Antiques, antoniojcrespo.com. Carpet on stairs (“Pecola”/Seagrass): Stark, starkcarpet.com. Credenza at end of hall (19th century, French); side chair: owner’s collection. A big skirted table is designer Suzanne Kasler’s trick to bring pretty fabric into a room that has French doors—and no draperies. Table lamp: Joseph Konrad, josephkonrad.com. Chair (“Campagne Armchair” #DL-CH41): Dennis & Leen, dennisandleen.com. That’s evident in the living room, where a calm canvas allows the details of the coffered ceiling and expansive arched window to shine. 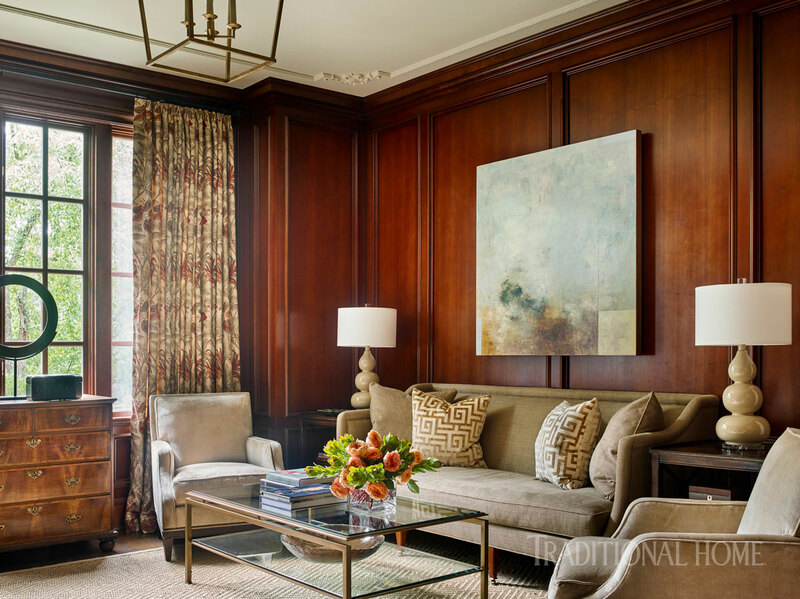 “There was no way to drape the window and no need to drape it,” Kasler says. “I like it as a feature in the room.” She had the wood muntins painted black to look like steel, giving the classic space a contemporary edge. The primarily new pieces mingle with Steve’s antiques, all dark-stained wood furniture that grounds rooms without defining them. “We wanted a foundation of traditional, but lighter and younger—not overdecorated,” Kasler says. “The goal was a beautiful home for a young family—chic-looking but easy to live in,” Kasler says. In this hangout spot, a TV hides in the antique armoire, and a traditional chandelier contrasts with contemporary art by Heidi Berrin Shonkoff. Wall and trim paint (“Elephant Tusk” #OC-8): Benjamin Moore, benjaminmoore.com. Chandelier (“Eternity Chandelier” #2099); mirror over mantel (“Bramble Mirror” #5039): Paul Ferrante, paulferrante.com. Pair of sofas (discontinued): Verellen, verellen.biz. Seat cushion on wing chair (“Canvas Cloth” #2121/01, colorway discontinued); aqua pillows on sofa (discontinued): Rose Tarlow-Melrose House, rosetarlow.com. 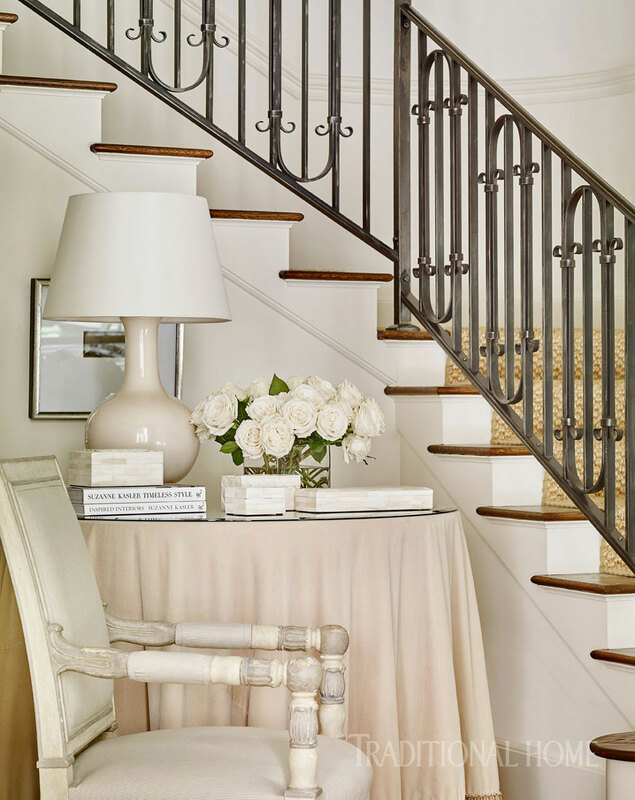 Beige patterned pillows on sofa; pair of white urns on console: Erika Reade, erikareade.com. Throw on sofa (“Bamboo Throw”/Spa #123): B.D. Jeffries, bdjeffries.com. Coffee table (“Tavolino Wood & Iron Coffee Table” #F-TB04); hurricanes on coffee table (“Hanging Hurricane” #F-AC49); spheres on coffee table (“French Cannon Ball” #F-AC31); wing chair by mantel (“Wooden Barrel Chair” #F-CH02): Formations, formationsusa.com. Vase on mantel (product line varies): Bungalow Classic, bungalowclassic.com. Andirons (“St. Pierre Andirons”): Jerry Pair, jerrypair.com. Console table at window (“Large Console Table”/oak): Holland & Co., hollandandcompany.com. Lamps on console (green temple lamp with gold base): Joseph Konrad, josephkonrad.com. Slipper chair (“Madeleine Slipper Chair” #1518-23 by Suzanne Kasler): Hickory Chair, hickorychair.com. Slipper-chair and drapery fabric (“Timur”/Sage, #JW 7209, by Jasper): Michael S Smith Inc., michaelsmithinc.com. Side table by slipper chair (product line varies): Mrs. Howard, mrshoward.com. Artwork to right of window (Rubato, by Heidi Berrin Shonkoff); artwork to left of window (Simple Garments, by Heidi Berrin Shonkoff): Pryor Fine Art, pryorfineart.com. Vase holding plant on side table; armoire: owner’s collection. In tune with that fresh vibe, she layered in subtle color with pillows, throws, and art. “It’s the perfect way to get color while keeping a room tailored and low-key,” she says. Above the mantel of the living room fireplace, the branch motif of a convex mirror by Paul Ferrante nods to views of nature just outside. 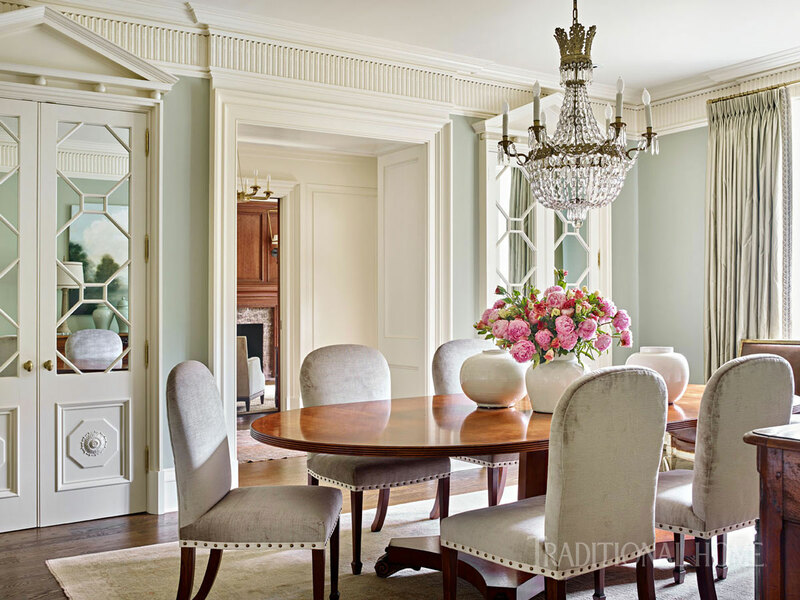 Color crescendoes in the dining room, where Kasler sheathed walls in a sage hue that shows off the fluted crown molding and mirror-front china cabinets Spitzmiller designed. 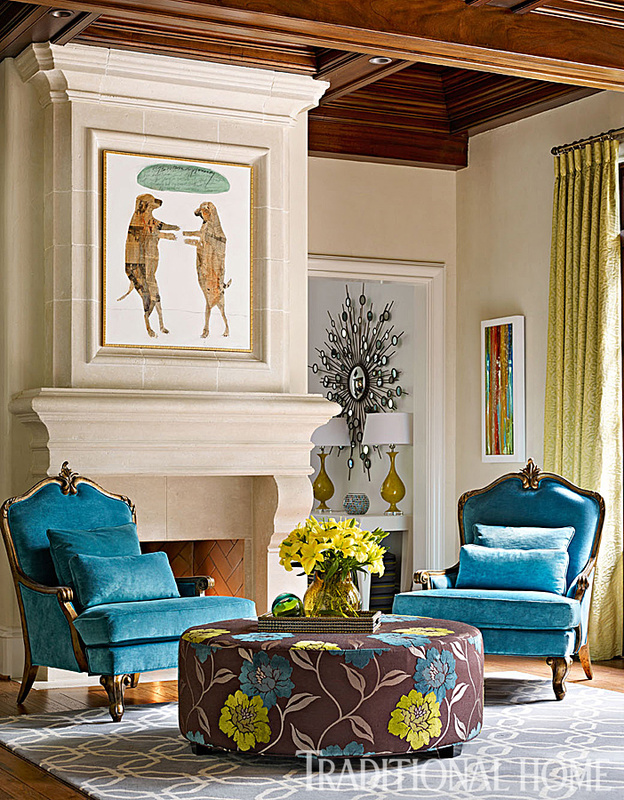 “Together with Suzanne’s touch of color, they make the room sparkle,” the architect says. A stained-wood Regency table, its curves echoed by svelte armless chairs, puts classicism at the center of the formal dining space. Walls in Farrow & Ball “Blue Gray” mesh with silk taffeta draperies in Schumacher fabric. Wall and ceiling paint (“Blue Gray” #91): Farrow & Ball, farrow-ball.com. Trim paint (“Linen White” #OC-146): Benjamin Moore, benjaminmoore.com. Area rug (Turkish Oushak): Moattar, moattar.com. Table (“Regency Pedestal Dining Table”); dining chairs (“Pella Upholstered Side Chair”): Holland & Co., hollandandcompany.com. Dining-chair fabric (“Jolie Velvet” #34781-14): Clarence House, clarencehouse.com. Dining-chair trim (“1-inch Sabine Border”/Ivory #977-56043-13): Samuel & Sons, samuelandsons.com. White vases on table (product line varies): Erika Reade, erikareade.com. Drapery (“Anniston Silk Taffeta”/Mineral, colorway discontinued): Schumacher, fschumacher.com. Drapery trim (#302505-847): Janet Yonaty, janetyonaty.com. Landscape artwork seen in mirrored door (by Charlotte Terrell): Pryor Fine Art, pryorfineart.com. Chandelier (19th century, French); leather chair by window (Paris flea market): owner’s collection. He also designed both mirrored and glass-front cabinetry for the kitchen, which serves as the hub of the home. “It’s where we love to gather,” Steve says. 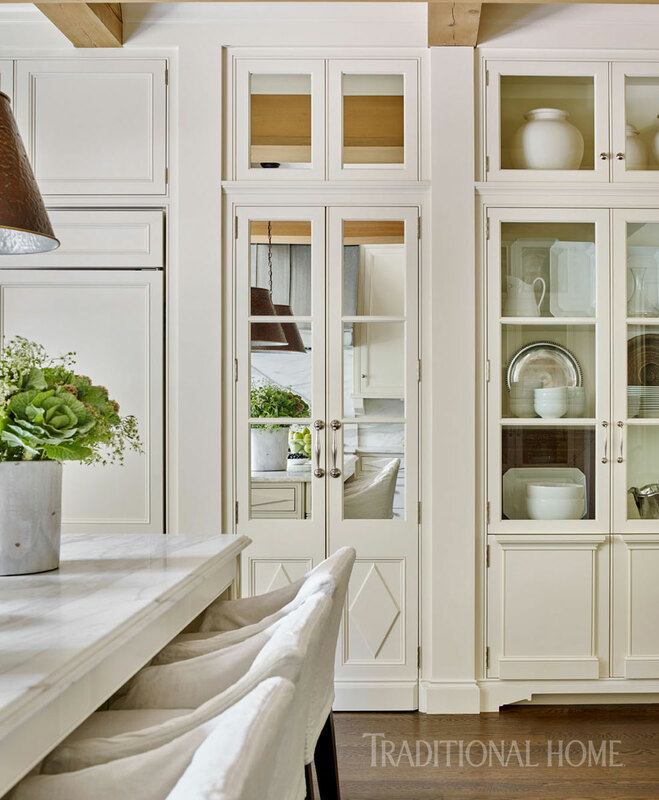 A mix of styles on cabinet fronts dials up the interest. To provide plenty of room for family, friends, and moments of shared culinary creativity, Spitzmiller annexed adjacent square footage to nearly double the size of the original kitchen. “Now it’s wider, more functional, and a whole lot prettier,” he says. Activity in the airy, casual space revolves around a center island with comfortable bar stool seating. Calacatta marble tops counters in the U-shape work zone and also serves as a luxe backsplash. Classic cabinetry pairs with rustic beams and hammered-metal pendants by Edgar-Reeves. Cabinetry (custom): Spitzmiller & Norris, spitzmillerandnorris.com. Marble countertop and backsplash: Calacatta Gold. Sink (Allia collection): Rohl, rohlhome.com. Bridge faucet (“Kitchen Faucet with Sidespray, Lever Handles” #P23051, For Town by Michael S Smith): Kallista, kallista.com. Window shades (“Dupont”/Moonstone Blue #1005-04): Kerry Joyce, kerryjoyce.com. Hanging lights over island (“Hand--Hammered Hanging Metal Shade”): Edgar-Reeves Lighting & Antiques, edgar-reeves.com. Slipcovered bar stools (“Campaign Counter Stool” #5206-51): Lee Industries, leeindustries.com. A fireplace warms the breakfast room where a cottage table and Windsor chairs invite casual dining. Ceiling and trim paint (“Linen White” #OC-146): Benjamin Moore, benjainmoore.com. Drapery (“Dupont”/Moonstone Blue #1005-04): Kerry Joyce, kerryjoyce.com. Area rug (custom, handwoven): Lyn Sterling Montagne, lynsterlingmontagne.com. 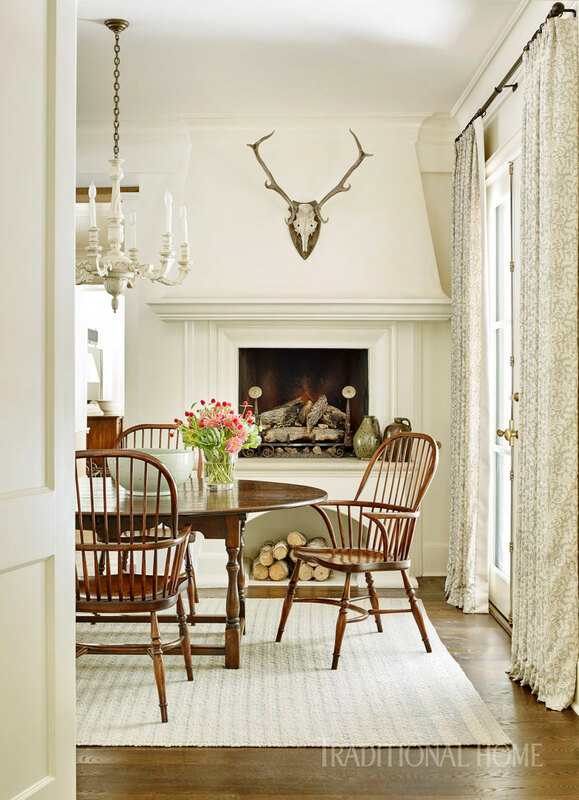 Dining table (“Cottage Breakfast Table in Oak”); dining chairs (“Windsor Stickback Arm Chair in Oak and Elm”); antlers (antique): Holland & Co., hollandandcompany.com. Bowl on dining table (product line varies): Erika Reade, erikareade.com. The kitchen opens to the family’s other go-to spot, the pool den. “It was a storage space with no windows. But I saw it as the best real estate in town,” says Spitzmiller, who installed a NanaWall, glass doors that open the entire wall to the patio, pool, and beautiful view beyond. “It’s a spectacular change,” Spitzmiller says. Pecky cypress—seen on beams in the kitchen—is used here in a coffered ceiling treatment. A wall of glass bifold doors makes it easy to blend indoors and out. Folding doors to patio: NanaWall, nanawall.com. Wall and trim paint (“Manchester Tan” #HC-81): Benjamin Moore, benjaminmoore.com. Area rug (“Pecola”/Natural): Stark, starkcarpet.com. Sofa (“Monroe” #1525-84 by Suzanne Kasler); coffee table (“Morris Cocktail Table” #1581-10 by Suzanne Kasler): Hickory Chair, hickorychair.com. Sofa fabric (“Mission Cloth”/Malt #92508-07); wing-chair fabric (“Vellino”#92213): Rogers & Goffigon, rogersandgoffigon.com. Wing chair (“Fairway Wing Chair” #77428): B.D. Jeffries, bdjeffries.com. Ceramic stool beside wing chair: Mrs. Howard, mrshoward.com. Wicker basket: Pottery Barn, potterybarn.com. Framed map, box on coffee table; wood sculpture on coffee table: owner’s collection. The wood paneled walls of the library are a departure from the linen white used throughout the rest of the house. 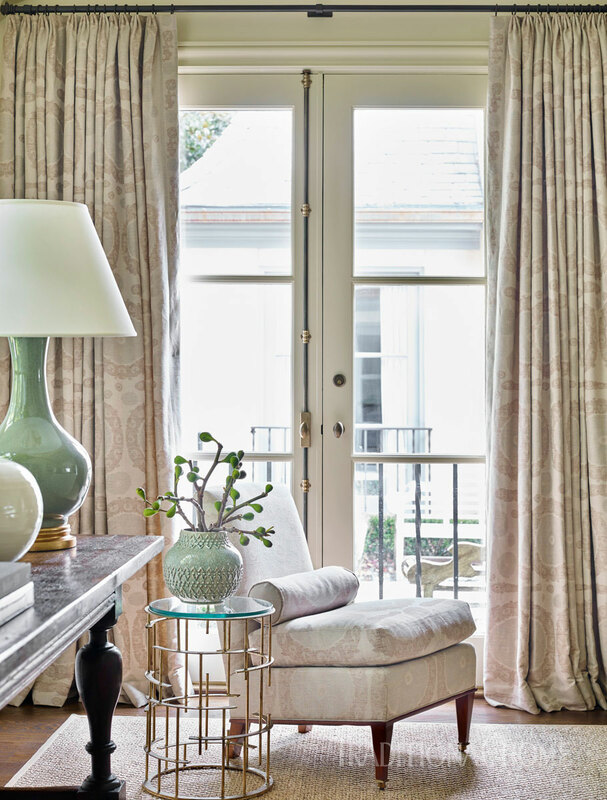 Drapery panels from Cowtn & Tout pull together all the colors of the cozy, classic space. Ceiling paint (“Carrington Beige” #HC-93): Benjamin Moore, benjaminmoore.com. Sisal rug (“Natura”/Seagrass): Stark, starkcarpet.com. Hanging light (“Darlana Medium Lantern” #CHC2165): Circa Lighting, circalighting.com. Drapery (from Cowtan & Tout): existing. Chest of drawers at window (“Antique Chest of Drawers in Oak and Walnut”): Holland & Co., hollandandcompany.com. Circle sculpture on chest; box on chest (antique Chinoiserie box): Jerry Pair, jerrypair.com. Sofa (“Southworth” #1521-85, by Suzanne Kasler); sofa fabric; coffee table (“Montpelier Cocktail Table with Clear Glass Top and Shelf” #1579-10 and #1579-12, by Suzanne Kasler); lounge chairs (“Monroe” #1525-24, by Suzanne Kasler): Hickory Chair, hickorychair.com. Pillows on sofa (“Labyrinth”/Beige #34129-1): Clarence House, clarencehouse.com. Lounge-chair fabric (“Mission Cloth”/Flan #92508-03): Rogers & Goffigon, rogersandgoffigon.com. Art behind sofa (by Peter Burega): Pryor Fine Art, pryorfineart.com. Sofa end tables (“End Table in Oak with Shelf”): Holland & Co., hollandandcompany.com. Table lamps (“Porcelain Gourd Lamp”/Tan, product line varies): Erika Reade, erikareade.com. 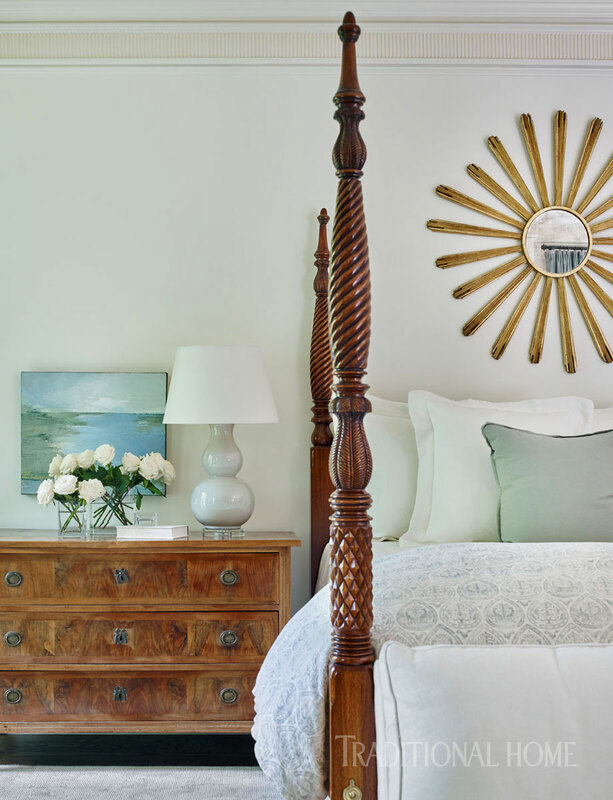 When Steve’s ready for some quiet time, the reimagined master suite, a neutral cocoon that shows off his carved antique bed and new freestanding tub, beckons. Beautiful blue linen draperies add a splash of classic color. Drapery (“Sablon Linen”/Water Jardin, discontinued): Calvin Fabrics, calvinfabrics.com. Mantel (custom): Spitzmiller & Norris, spitzmillerandnorris.com. Sconces above mantel (“Small Chateau Wall Sconce”): Dennis & Leen, dennisandleen.com. Artwork between sconces; pillows on chairs: Mrs. Howard, mrshoward.com. 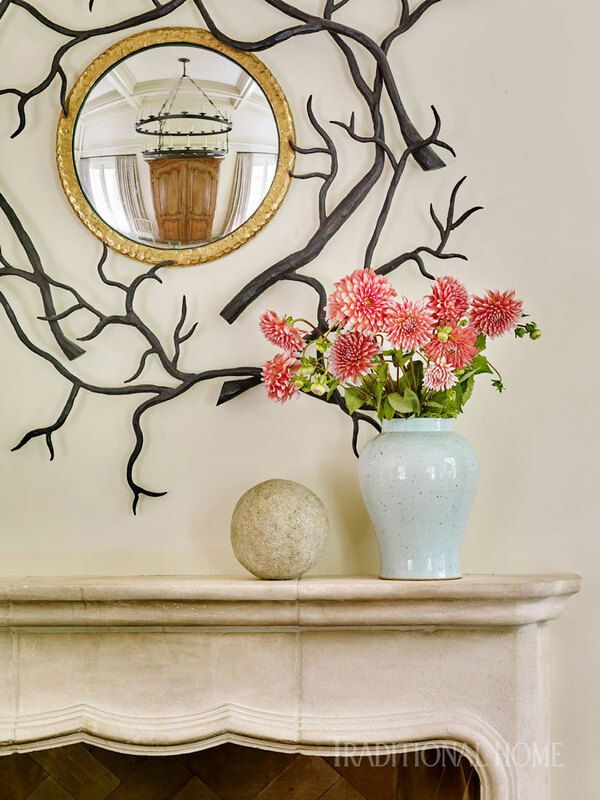 Botanical print on mantel: Lauren Lachance Collection, laurenlachance.com. Pair of lounge chairs (“Virginia” #1527-24 by Suzanne Kasler); side table by lounge chair (“Eden” #1385-10 by Suzanne Kasler); sofa facing mantel (“Leigh Armless Sofa” #1504-51 by Suzanne Kasler): Hickory Chair, hickorychair.com. Sofa and chair fabric (“Bryton Linen Herringbone”/Ivory #54925): Schumacher, fschumacher.com. Bedskirt fabric (“Silk Canvas”/Azure #NC0105-101, discontinued): Nancy Corzine, nancycorzine.com. Duvet (custom, “Montague”/Bay Blue on Natural #2111/05): Rose Tarlow-Melrose House, rosetarlow.com. 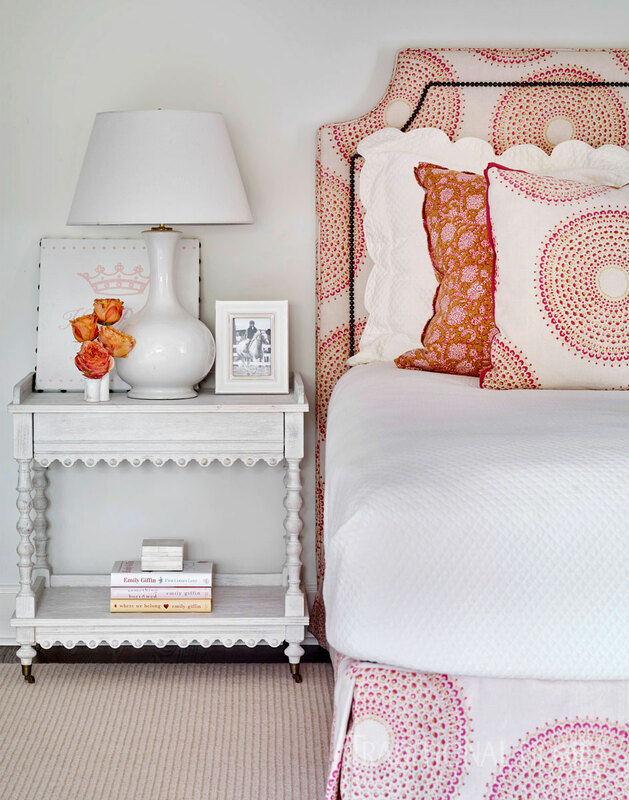 Bed cover and shams (Ivory): Gramercy Fine Linens & Furnishings, shopgramercy.com. An antique four-poster mingles with new seating area furniture by Suzanne Kasler for Hickory Chair. Throw pillow on bed: Mrs. Howard, mrshoward.com. Bedside chest (19th-century, French): Huff Harrington, huffharrington.com. Table lamp; mirror behind bed: Joseph Konrad, josephkonrad.com. Art behind chest: owner’s collection. 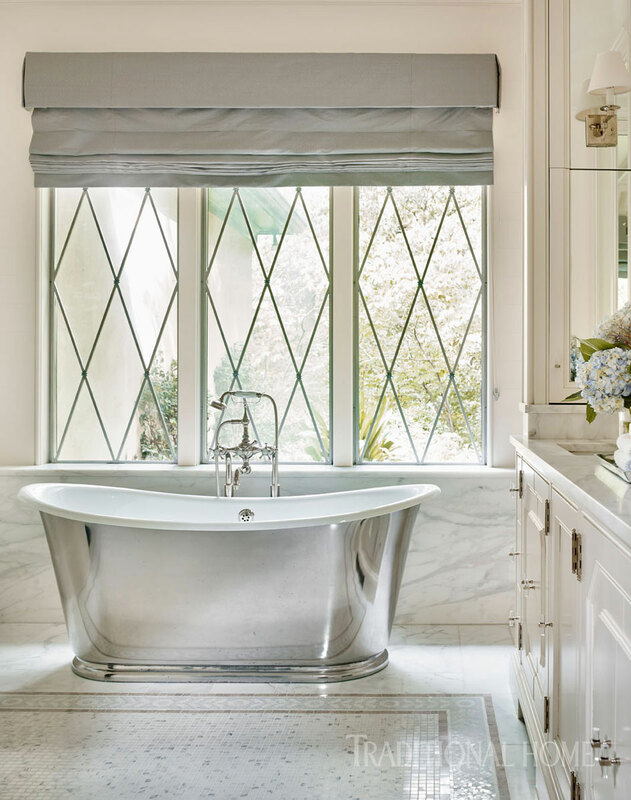 Set against a backdrop of elegant Calacatta Gold marble, a Waterworks tub steals the show in Steve’s bath space. Wall and trim paint (“Linen White” #OC-146): Benjamin Moore, benjaminmoore.com. Marble on floor perimeter and on wall behind tub: Calacatta Gold. Bathtub (“Candide”); flooring (custom); bath fixtures: Waterworks, waterworks.com. Window shades (“Silk Canvas”/Azure #NC0105-101, discontinued): Nancy Corzine, nancycorzine.com. 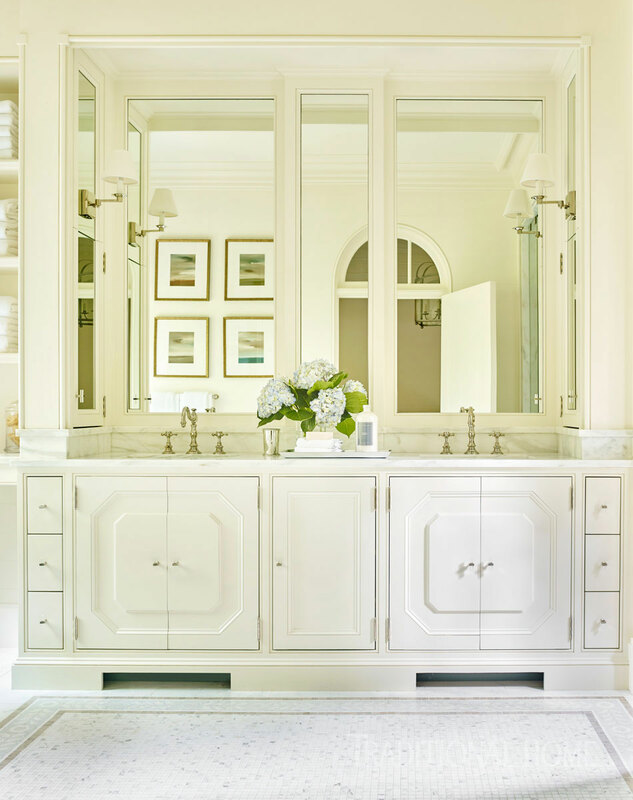 A custom double vanity continues the elegance. Vanity cabinet (custom): Spitzmiller & Norris, spitzmillerandnorris.com. Pair of sinks; faucets: Waterworks, waterworks.com. Art seen in mirror: owner’s collection. Each Fallon girl also has her own bed-and-bath space. Colorful, playful patterns are used judiciously against plenty of airy white. “It gives them a great backdrop to personalize their spaces the way they want,” Kasler says. Area rug (“Cape May”/Chowder, by Helios Carpet): Myers Carpet, myerscarpet.com. Bed fabric (“Kochi”/Kashmir, discontinued): John Robshaw, johnrobshaw.com. Bedside table (“Albert Side Table” #660033): Bungalow Classic, bungalowclassic.com. Table lamp (“Suzanne Kasler Gourd Lamp,” Large #LA136): Ballard Designs, ballarddesigns.com. Youthful patterns, colors, and attitude put some pop in this cozy sitting area. Chandelier (painted Benjamin Moore “White Dove” #OC-17): existing. Area rug (“Cape May”/Chowder by Helios Carpet): Myers Carpet, myerscarpet.com. Window shade (“Calicut”/Meadow, discontinued); patterned pillows on sofa (“Mathura”/Kashmir, discontinued): John Robshaw, johnrobshaw.com. Sofa fabric (“Moed Texture” #1677, discontinued): Calvin Fabrics, calvinfabrics.com. Sofa; coffee table: owner’s collection. What teenage girl wouldn't love a pristine white bathroom with a chic cheetah-pattern shower curtain? Wall, ceiling, and trim paint (“White Dove” #OC-17); paint on back of shelves (“Manchester Tan” #HC-81): Benjamin Moore, benjaminmoore.com. Flooring (field tile in statuary, honed): Waterworks, waterworks.com. Window shade and shower curtain (“Saba on Linen”/Crème #5562/01, discontinued): Rose Tarlow-Melrose House, rosetarlow.com. Dressing table (custom): Spitzmiller & Norris, spitzmillerandnorris.com. Stool at dressing table: owner’s collection. Sconce (“Reed Double Sconce” #TOB2126, by Thomas O’Brien for Visual Comfort): Circa Lighting, circalighting.com. Homeowner Steve Fallon with daughters Grayson, Darby, and Ellie. Tour this colorful Atlanta home.